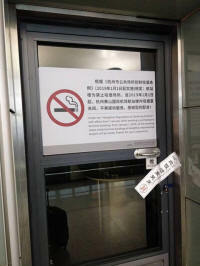 Update from Christophe L., Jan 17th 2019: Hangzhou airport smoking rooms seem all closed according to new regulations. The airport has six smoking rooms. The smoking room in the international terminal is at the departure floor of the remote boarding gate. The smoking rooms in the domestic terminal are to the opposite of B08 boarding gate, B12 boarding gate, B14 boarding gate, to the left of B43 boarding gate and B35 boarding gate, respectively.